I’m in love with this soup and it was named after the unit of measurement for these three special ingredients. Normally when I’m creating in the kitchen, I often put in a little of this and little of that… My husband says that he loved my cooking but that the recipes often were not reproducible. I created this unit of measurement “a handful” for this soup to make a free flowing recipe that is reproducibly delicious! Soup for anytime, especially breakfast! 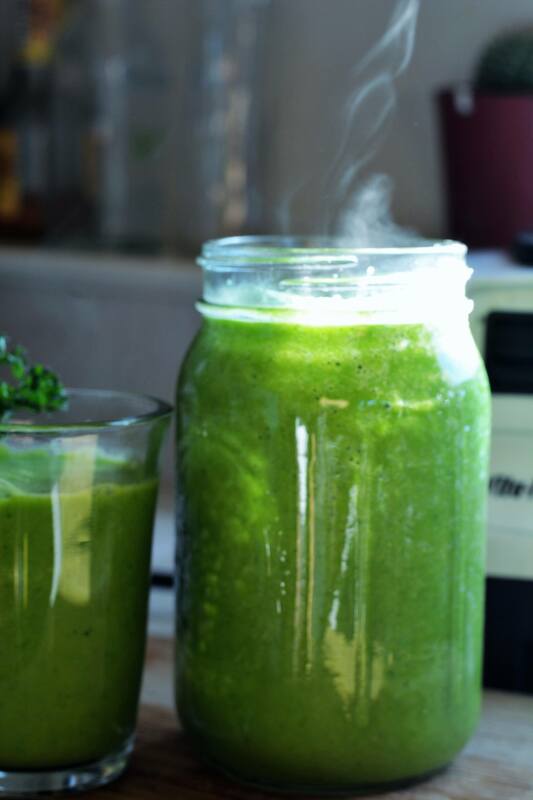 I’m a Chinese medicine practitioner and in my practice we see lots of clients starting their day with green smoothies; usually with fruits, nuts and grain milks, even though green smoothies are great, they are “cold” in nature. Chinese medicine believes that if you start your day with cold, raw food, your body will have to work much harder to process it. Your stomach prefers warm food, especially in the morning as your body is trying to fire up. 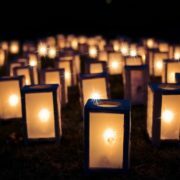 This is a warm nourishing alternative, just in time for the New Year to remedy all the holiday indulges, enjoy! You will need a Vitamix or comparable blender and a medium sized pot. 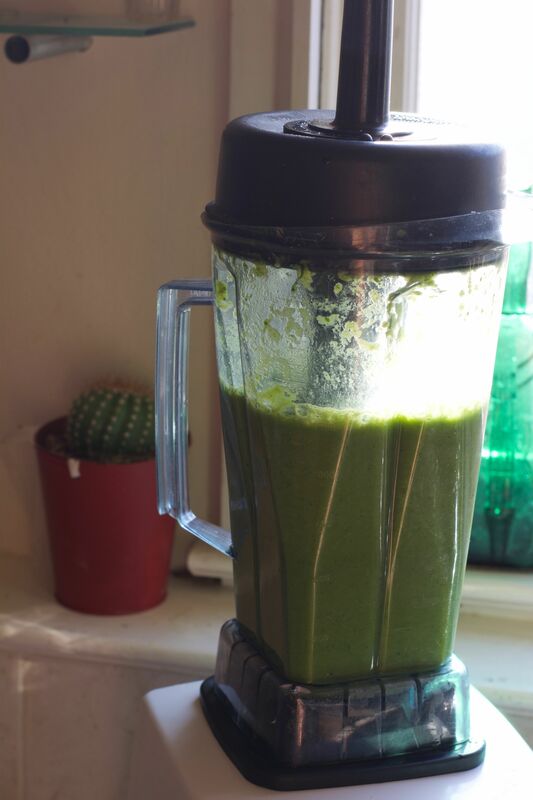 I’m a huge fan of Vitamix. I’ve had mine for over 10 years and used this same unit when I was a caterer for 4 years and only had to replace one part. 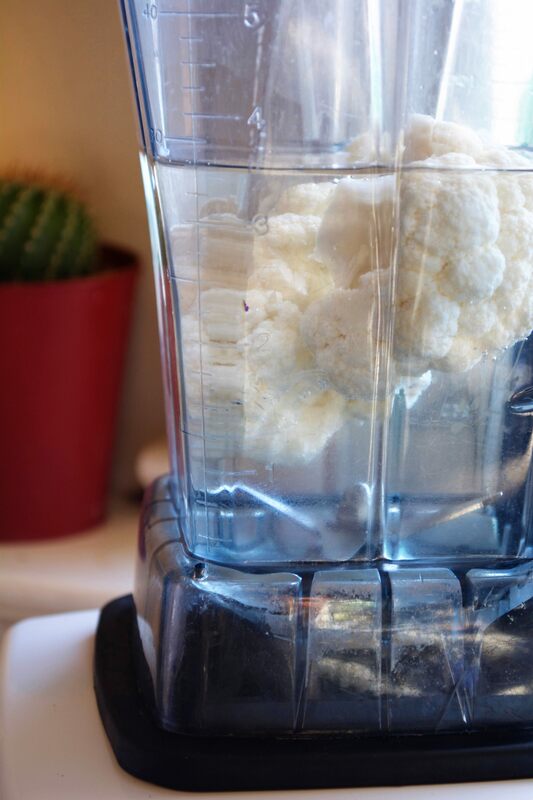 Measure the water in a 4 cup measuring cup or in the Vitamix to 2 ¾ cups, then add cauliflower till water line reaches 3 ½ cups. 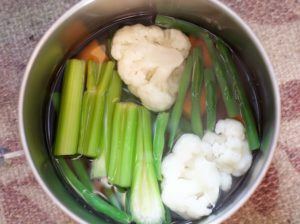 Add the measured water and cauliflower to pot. Chop carrots and celery in half and add to pot. Cover pot with lid, turn heat to high and cook for 5 mins. 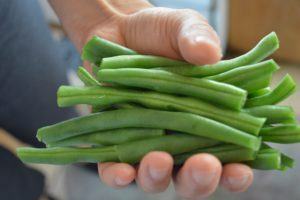 After 5 mins, add a handful of string beans and cook for an additional 2 mins. 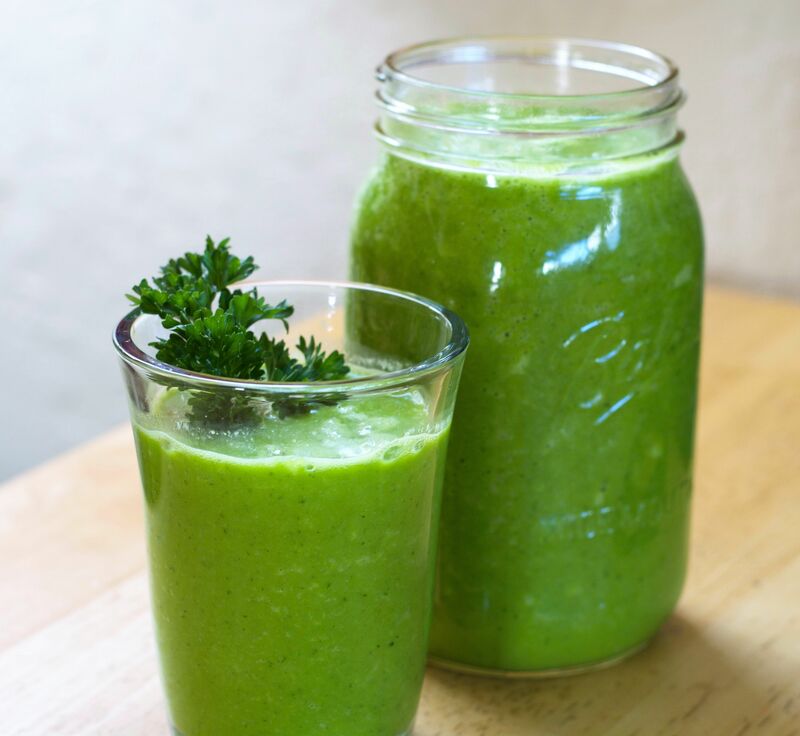 In the Vitamix, put in one loose handful each of spinach and parsley. 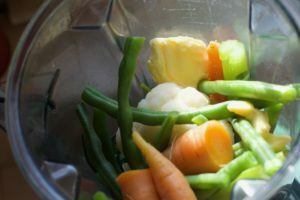 Add the hot cooked veggies and the water into the Vitamix. Add grass-fed butter and Himalayan salt. IMPORTANT! COVER BLENDER TIGHTLY and make sure blender is on low before turning on. Turn on blender starting at LOW SETTING. I’m saying this twice because you don’t want this hot soup to spray out. 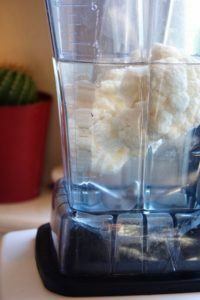 If your Vitamix has a plugger, hold it down before you turn it on. Then slowly increase the power. Blend for 2 minutes or until smooth. Makes 5 ¼ cups of soup. Enjoy warm. **Caution if you are a nursing mother, you may want to omit parsley as it will slow your milk production. 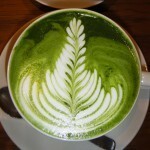 Unless you are experiencing too much milk, then you can leave the parsley in. Cauliflower, carrots, celery, string beans and spinach are high in antioxidants. 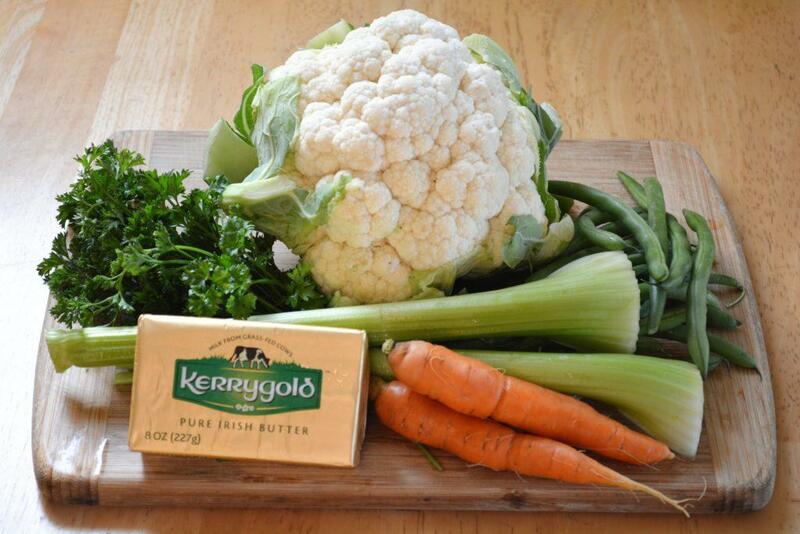 Cauliflower is a great low starch option to thicken the soup. Carrots benefit the skin and eyes. Celery is good for the joints, bones and arteries. String bean is high in protein, fiber and minerals. Spinach is rich in iron and builds blood. 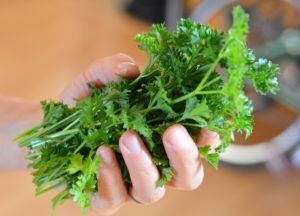 Parsley is a remarkable source of nutrition, several times higher in vitamin C then citrus. 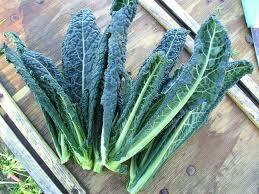 A good source of provitamin A, chlorophyll, calcium, sodium, magnesium and iron. Healing with Whole Foods says parsley strengthens the adrenal glands, benefits the eyes and nerves, as well as treats poor digestion and even strengthens the teeth. Grass fed butter is best due to it’s plentiful Omega 3’s and Vitamin K2. 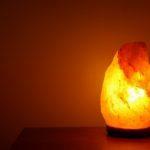 Himalayan salt is known to contain 84 trace minerals. Thus actually containing less sodium than table salt. The trace minerals adding more nutrients necessary for bodily functions. I recommend chewing even blended soups and smoothies. Chewing will help mix in your digestive enzymes and get your stomach ready for food. Enjoy the 3 Handfuls Green Soup! Try it and leave a comment! Pitchford, Paul. (1993). 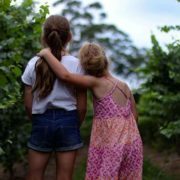 Healing with Whole Foods. Berkeley, CA: North Atlantic Books. Treasure De La Cruz, L.Ac.